Pocket full of stones | Help! I live with my Italian mother in law! The dark horse entered like an unwelcome guest. Frozen, I paced back and forth feeling the shroud of doubt, fear and failure. Why do I bother? I asked to no one in particular. My inner voice pushed me further, I put my shoes on, grabbed my keys and left before the dark horse settled in for the duration. If I move fast enough, maybe I can outrun it. Where was I going? I don’t know. My legs just knew they needed to start walking and to continue to walk until I no longer knew where I was. Just as long as wherever that ended up to be, it increased the distance from where I was now. Walk until you are tired and then just keep walking some more. The warm sun soaked into my black jacket and as I drew up closer to the sea, I saw a glimmer of green light. Quickly, I turned towards the heavy metal stairs that led to the beach. I still had no idea what I was doing or where I was going but I knew I wanted to get closer to the child who was playing with the green light. 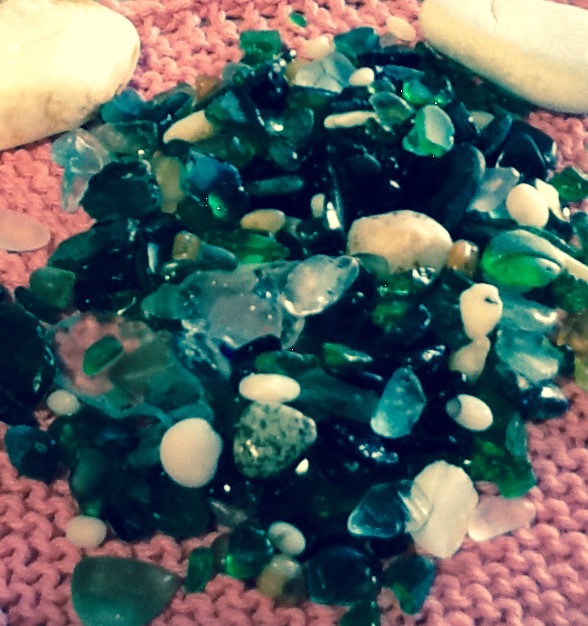 I swept my hands across the salty rocks and found a tiny piece of sea glass. Green and perfect, my soul soared with delight and a vision of a mosaic danced in my head. The dark horse was gone. An elderly man approached me. His leathery skin was tanned and he had the calm nature of someone who knew every inch of that beach. “What are you searching for Signora?” For me, that was a very loaded question. How do I begin to explain to this kind, old, man that I’m in fact running away from a dark horse? He bent over, took a piece of shell in his hand and gently handed it to me. “You will need shells too.” We walked together searching for hidden treasures as he spoke about tomorrow’s solar eclipse and which beaches had the best shells and green glass. He walked me to the edge of the shore, along the point that jutted out beyond the pebbles. He pointed West. “You see the end of the shore? That is Bocadasse. Go there tomorrow, you will find more”…and with that, he waved a friendly goodbye. This entry was posted in Art, Nature and tagged depression, life. Bookmark the permalink.